« What happened about Yaya Toure, and what question should we be asking? It’s been an inauspicious start to life under Unai Emery this season, with Arsenal losing their opening two Premier League games under the Spaniard. With two tough assignments against Manchester City and Chelsea out of the way, the Gunners are expected to improve significantly over the coming months and Aaron Ramsey is likely to play an important role. Ramsey has been a terrific servant to the club and the Welshman’s consistency is vitally important to Arsenal’s style of play, but contract negotiations have been slow and cumbersome and the midfielder has just 11 months left on his current deal. Meanwhile, Unai Emery opted to leave the former Cardiff player out of the starting eleven against Chelsea but he looked extremely bright during his 22-minute cameo and looked far more dangerous than the out-going Mezut Ozil. Ramsey’s name has been linked with both Chelsea and Manchester United and the 27-year-old will be able to speak to interested parties in January. He is the longest-serving player at the Emirates and fans will be desperate for the midfielder to remain with the club but there is believed to be a significant discrepancy between the two parties and progress has been slow so far. Despite having their highest-ever wage bill this season, Unai Emery will be keen to avoid losing any key players in January, especially with the Gunners’ European commitments this campaign. Arsenal reached the semi-final of the Europa League last season before crashing out at the hands of Atletico Madrid. With Diego Simeone’s side returning to the Champions League this year, Arsenal have been installed as second-favourites in the Europa League outright odds with William Hill and can be backed at 7/1. Maurizio Sarri’s Chelsea are the early frontrunners in this market and are available at 6/1. This situation is all too familiar to Arsenal fans who saw the club fail to reach a deal with Alexis Sanchez earlier this season with the Chilean eventually joining Manchester United in January 2018. Henrikh Mkhitaryan arrived in North London as part of the same deal. Supporters will be hoping that the club’s hierarchy are able to avoid falling into the same trap once again and can tie Ramsey down to a longer-term deal. He has also been linked with a move to Barcelona and although losing the Welshman would be a blow, very few fans are likely to begrudge the midfielder a move to Catalonia. Arsenal have a battle on their hands for fourth place this season, facing stiff competition from Spurs, Chelsea and Manchester United and they simply cannot afford to help strengthen one of their rivals. Unai Emery is keen to maintain his services describing him as an “an important player to me” but despite this, the club’s decision-makers are yet to be convinced. It would be a statement of intent to keep hold of Ramsey and it would help prove that the club have managed to avoid repeating the same mistakes which have proved costly over the past couple of campaigns. Wherever he ends up next summer, Arsenal mustn’t help strengthen one of their Premier League rivals once again. Whether it’s in the Europa League or the top flight, Ramsey’s ability to drive forward can get the fans on their feet and he can be a hugely influential performer. The Gunners must tread carefully and ensure that Chelsea or Manchester United aren’t given any opportunity to swoop in and pick up their talented midfielder. rubbish post trying to advertise gambling odds…..Tony, who writes trhis shite and why do we publish it on UA? 1 Renewing Ozil cost a fortune, now we cant sell him. A-another always preach doom about losing whoever then preach doom because we pay so much.. If Ramsey wants out why keep him? Tony, if you need to publish this stuff in order to fund untold – I’m well aware that running a website isn’t costless – can you make clear that it is a promoted story. An article that, amongst other things, purports to know what arsenal fans think, when you have correctly criticised so many others for that kind of nonsense, does devalue the site’s reputation for sensible thoughtful writing. Mad Eye I think everyone is aware of the way the system works, rather like everyone knows that the breaks every 15 minutes in a programme on ITV are advertisements and nothing to do with the programme and may not take the same view as the programme. I very deliberately control the number of such posts so they are quite rare overall although they can on occasion come close together. 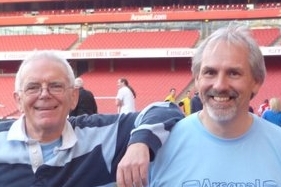 Goonermay – perhaps a little more detail might have helped convince other readers. In this case of Aaron Ramsey who is reported to be stalling on extending his staying at Arsenal beyond next summer, but will extend if the club gives him a significant wages increase that will match the wages Mesut Ozil is earning at the club according to unconfirmed media reports. The Arsenal hierarchy bosses who I believe know very well what to do when it comes to players extending their contracts at the club will not succumb to pressure from Ramsey and his agent to force a big wage rise at the club beyond proportion in a kind of appeasemenr to Ramsey to extend. Rather for the club to do this, the bosses at Arsenal hierarchy will prefer to keep Ramsey in the wait to see if he’ll make a significant contribution to Arsenal campaign in the PL during the first half of this season to Arsenal charge to win the PL Title before they’ll consider if they should offer him a wage increase equivalent to that of Ozil which Ramsey is eyeing or less than that to extend at the club. And another issue the CEO and Emery at the Arsenal board and the technical branch could also want to wait to see, is to see if Ramsey will stay strong on his feet to be playing strongly for Arsenal regularly in the PL without getting the injury that will sideline him on the sideline for months, but if he stays on his feet strongly for Arsenal to give his 100% in all games for the club and influencing wins in the games for Arsenal during the first half of the season, there is the strong possibility Ramsey could be offered a significant wage increase in January to extend his contract at the club. But right now, the Arsenal hierarchy is not looking to be keen to offer him any extensive wage increase to extend beyond what it has been offered to him to sign to extend which he has refused. Let him sign it now to extend. This doesn’t mean he won’t get the significant big wage increase he wants if he perform big for Arsenal the first half of the season to justify getting it, he’ll then be given. Sell him! He’s waaay overrated and not worth the money he wants. He won’t make a starting 11 so let him come off our rivals bench near the 64th minute. ie: Arsenal are currently poor and in decline. I don’t think that there is any evidence to support any of these conclusions. I think it’s indicative, when even ur sponsors have a different message, yet feel your audience is a fallow one.